The National Institute for Civil Discourse will be a center for discussion and policy-making on civility in public debate, representatives said at a morning press conference. Former presidents George H.W. Bush and Bill Clinton will be honorary co-chairmen of the center. The center was created in the wake of the Jan. 8 mass shooting that authorities call an assassination attempt on Giffords. Six were killed and 13 other wounded, including the congresswoman. “America faces big challenges in… and preserving our leadership for security, peace, freedom and prosperity in the world. Meeting them requires an honest dialogue celebrating both a clarification of our differences and a genuine stand for principled comparisons,” said Clinton. In 1992 the Clinton campaign produced this advertisement focusing in on Bush’s 1988 “No New Taxes” pledge as evidence of his dishonesty. 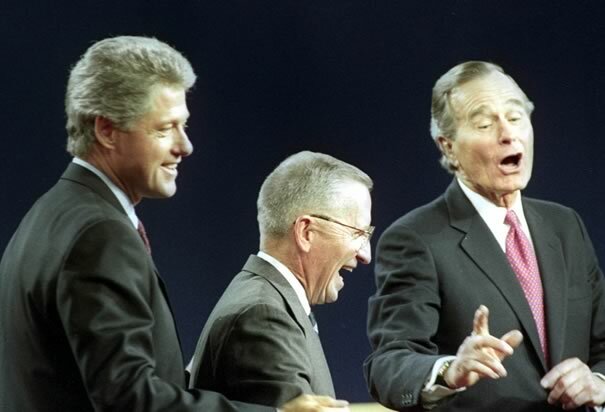 Bush agreed to increase taxes to reduce the budget deficit in a compromise with Congressional Democrats in 1990. Technically there were no new taxes, but there was an increase on existing taxes necessary as a result of Reagan’s economic policies. “Our country needs a setting for political debate that is both frank and civil, and the National Institute for Civil Discourse can make a significant contribution toward reaching this goal,” said Bush. In his 1992 campaign Bush accused Clinton of meeting with communists on a trip to Russia he took as a college student. He also said that his dog Millie knew more about foreign policy than “those two bozos”, referring to Clinton and Al Gore.